Working with remote peers in realtime on the same map is a great way to enhance collaboration or widen and deepen an interesting conversation. You may even encounter new people with shared interests and start exploring how to work and have fun exploring together! The latter two functions are active whenever you&apos;re viewing a map with other signed in collaborators. The first two can be accessed through the Junto panel, at the right of your screen. Click the blue-green "junto" icon on the right center of screen, opening the Junto panel. In the upper right, you can see participants who are currently viewing or working on the map. 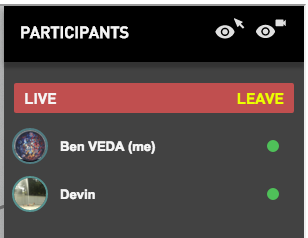 By clicking the green "+" button next to a participant&apos;s name to invite them into real-time, they will receive a pop-up message inviting them to the conversation. In the meantime, the button will show that the invitation is pending. Once another mapper accepts the invitation, a live stream will be enabled on both user&apos;s views of the map, with controls to disable either video or audio next to your own streaming bubble. To exit video chat, press on the red "LEAVE" button next to your name, or leave the map page. 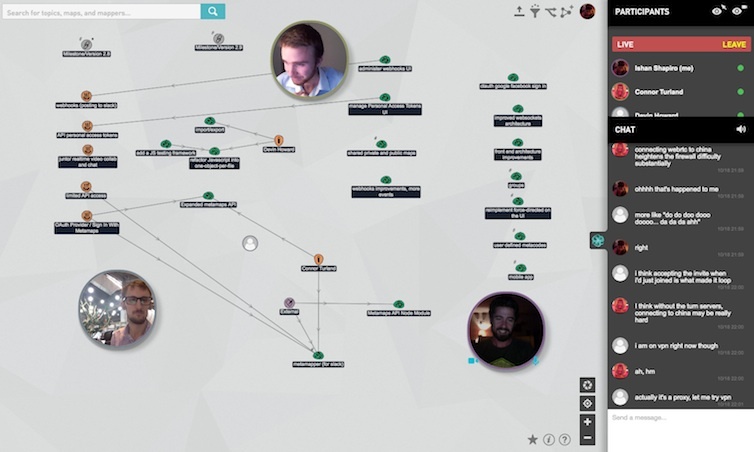 Text chat can be used by any user at any time, both in and outside of realtime broadcast. Text will remain on the map for view and engagement by future signed in visitors. If someone else joins you on the map (opens it from a different device) you will see a brief notification message and their cursor (avatar image) will appear on your map. You may also notice a set of light sound effects associated with certain actions, such as mappers joining and leaving, new text messages, and a ring tone when a call is starting.